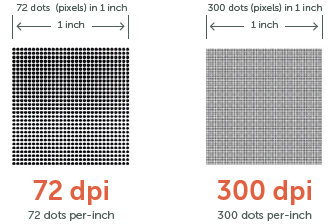 All file formats must be 300 dpi (dots per inch) resolution for high quality. 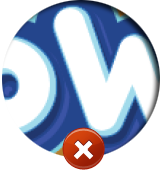 The images designed for the web have a low screen resolution of 72 dpi. 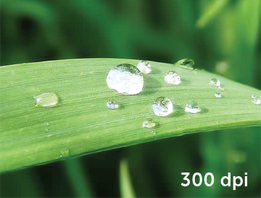 Print images need to be created at 300 dpi or there will be a drop in the image quality. Images should be minimum 300 dpi. Low resolution images print with jagged edges and appear fuzzy. An image must be 300 dpi when you create your design. 72 dpi are internet images for quick screen loads and will not print clear and crisp on a printing press. without becoming blurry and losing quality. Most common types of vector graphics: Fonts, shapes and logos. Preferred program for creating and editing vector files: Adobe Illustrator. 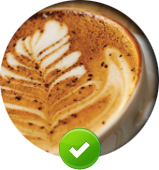 Vector files can be scaled to the size that you wish without ever losing quality. Anything created in photoshop will alwaysbe a bitmap (raster) file. 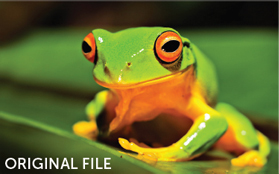 Popular raster file format extensions include: jpg/jpeg, psd, png, ti, bmp and gif. Raster is not recommended for high quality printing including digitial printing or oset printing. 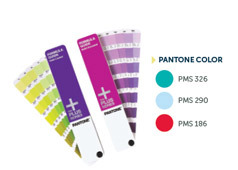 All files must be CMYK when printing o set full color or Pantone colors when printing spot colors. Files can be printed in either CMYK or RGB color mode. Our presses calibrate each job accordingly. 4 color process is using CMYK to create any color you like. The letter sux refers to the paper stock on which it is printed: a "C" for coated or gloss paper, "U" for uncoated paper and an "M" for matte or dull paper. 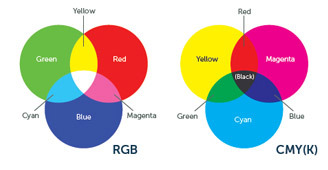 There are two entirely di erent medias: The monitor displays colors according to transmitted light in the RGB (red, green blue) gamut, the paper displays colors according to the absorption & reflection of light of CMYK colors (cyan, magenta, yellow and black). Bleed is the portion of the product that will be trimmed o when it is cut to the final size. We automatically trim the bleed o each sidewhich will result in the desired final size. 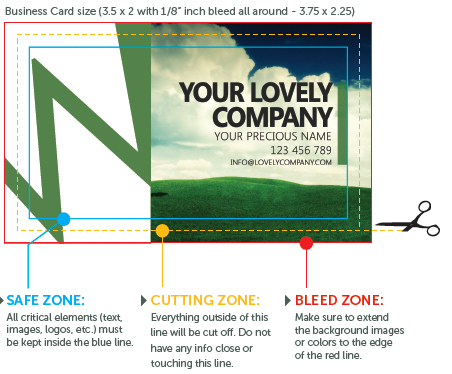 The main reason for including bleed when designing printed materials for your business is to avoid the white strips that will run around the edge of your print. This white strip can occur when there is movement during the printing and cutting process. Create a new document, you will find the bleed section at the bottom of the window. Do not submit a file with a 1/16" inch bleed. Must be .125" (1/8") on all 4 sides. All background images or shapes, should be extended to fill the bleed area. 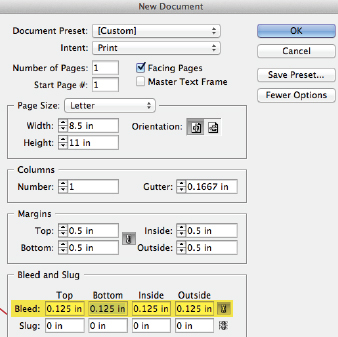 For any large format documents, make sure the bleed is atleast 1" inch. Always outline fonts when sending Ai files (illustrator). Any type would be best to setup in Illustrator or InDesign for best quality. Fonts created in photoshop will not clean and sharp. All fonts should be no smaller than 7pt, as they will be hard to read on print. Keep in mind, that some fonts are restricted to print. They might show up on the pdf file but due to the restriction, they will not show on print. We do not recommend borders. However, if necessary keep all borders well inside 1/4" around. WHY IS IT RISKY TO HAVE BORDERS IN YOUR ARTWORK? The reason most people use borders - It is very easy to add in any design software, and it looks good on the computer screen, but when printed and cut, even a small shift (mechanical tolerances on cutter and press) can end up making the finished product look uneven. So the best thing to do is avoid it as much as possible. Spot UV (gloss) business cards are a great way to impress customers and build overall company image. Spot gloss adds a very distinguished flare that takes ordinary business cards to the next level of professionalism. It is best used to highlight important areas of the business card design. In general, spot gloss is one of the greatest custom upgrades that can accompany full color silk business card printing. Spot UV is best for bold fonts and solid shapes. Gradients will not transfer the same when using Spot UV. Spot UV is a solid coating and not a gradient. Thin fonts and thin lines are not recommended for Spot UV, as they are too delicate and might not transfer as crisp or it might now show on the final product. Keep in mind that any fine detail in logos or artwork might not transfer the same when doing Spot UV. The more simple the UV shape, the better and cleaner UV you'll get. First, when submitting files that have Spot UV, the UV and print files need to be separated. For a business card that will have UV on front and back, there will be a total of 4 files (2 printed, and 2 UV files). For the front of this business card, you will notice only the text at the bottom of the card. This file is what will be printed, not UV. This also applies for the back of this business card if you are doing a double sided card. FileNow, what you want to do is make your UV layers 100% black. 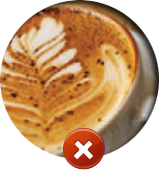 The white background indicates no UV. Anything that is colored with 100% black will be UV gloss. Your CMYK colors should read — C: 0% | M: 0% | Y: 0% | K: 100%. This is what your files should look like when submitting them for Spot UV. Foil stamping is a special kind of printing procedure where heat, pressure, and a metallic paper (foil) is used to create dierent shiny designs and graphics on various materials. Foil stamping gives the stamped design a shiny and incredible look. Great way for your product to stand out and look amazing. Foil stamping is best for bold fonts and solid shapes. Gradients will not transfer the same when foil stamping. Foil is a solid stamp and not a gradient. Thin fonts and thin lines are not recommended for foiling, as they are too delicate and might not stamp as crisp or it might now show on the final product. Keep in mind that any fine detail in logos or artwork might not transfer the same when foil stamping. The more simple the artwork, the better and cleaner foil you'll get. First, when submitting files that have foil, the foil and print files need to be separated. For a business card that will have foil on front and back, there will be a total of 4 files (2 printed, and 2 foil files). For the front of this business card, you will notice only a photo and black rectangle. This file is what will be printed, not foil. This also applies for the back of this business card if you are doing a double sided card. Now, what you want to do is make your Foil layers 100% black. The white background indicates no foil. Anything that is colored with 100% black will be foil stamped. Your CMYK colors should read — C: 0% | M: 0% | Y: 0% | K: 100%. This is what your files should look like when submitting them for foil stamping. Embossing is a great way to enhance the look and feel of any paper. There are several things that need to be attended to in an embossing project. The metal dies to be used, the paper to be used, the creation of the artwork and the embossing details of course. When using lettering use sans serif fonts and space them so that there is enough space between each letter to allow for the embossing eect. Blind embossing is always best, to really show the emboss eect. Thin fonts and thin lines are not recommended for embossing, as they are too delicate and might not stamp as crisp or it might now show on the final product. Keep in mind that any fine detail in logos or artwork might not transfer the same when embossing. The more simple the artwork, the better and cleaner emboss eect you'll get. First, when submitting files that have embossing, the emboss and print files need to be separated. For a business card that will have embossing on front and back, there will be a total of 4 files (2 printed, and 2 emboss files). For the front of this business card, you will notice only a orange rectangle. This file is what will be printed, not embossed. This also applies for the back of this business card if you are doing a double sided card. FileNow, what you want to do is make your emboss layers 100% black. The white background indicates no emboss. Anything that is colored with 100% black will be embossed. You can simply do this by adding a color overlay to the merged layer. Your CMYK colors should read — C: 0% | M: 0% | Y: 0% | K: 100%. This is what your files should look like when submitting them for embossing.